Dressing in the morning becomes a breeze with these pearl bracelets. They are the best. They are strung on elastic bands which makes them easy to place on one's arm and easy to remove. (no fuss no must) I recommend them highly. I matched them with other pearl jewelry that I had purchased in the past. 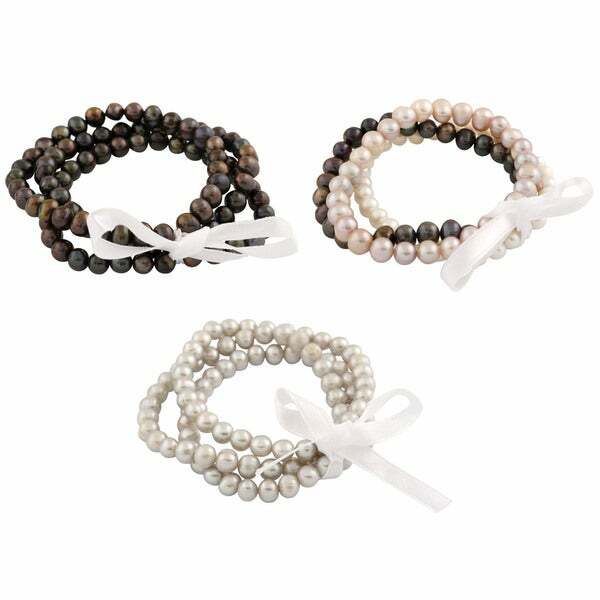 White, grey, and black freshwater pearls on elastic bands create a lustrous and sophisticated aesthetic, making this set of three bracelets an excellent way to imbue your wardrobe with elegance and charm. The bracelets are adjustable as well as elastic for a perfect fit. The strings broke...probably dry-rotted. Have onyx n other pearls with elastic bands but they have not broken. I love my pearl bracelets! I have been wearing them as my "signature look" for many years now! Thank you! Beautiful! I am so happy I chose this bracelet as I know it will make a wonderful gift when I am ready to present it! Not the best pearls to give as a gift. I would suggest not getting them.. I didn’t realize these would be elastic. That was a little disappointing. Made them seem cheaper. But they’re alright for the price. I guess they were pretty inexpensive. "Do you get the 3 sets pictured or does a set of 3 mean one of those in the picture (with 3 bracelets tied together)?" "Could overstock provide a significant discount if I purchased 125? Can these bracelets be worn individually?"